Students participating in Energy Trust of Oregon’s Net Zero Emerging Leaders internship grant are poised to share insights from their three-month experience with the Portland design community. Funded by Energy Trust, the Net Zero Emerging Leaders grant is given to Oregon architecture firms to employ students for a 12-week internship. The interns support each firm’s AIA 2030 Commitment— a national initiative to evolve design practices so that participating firms can work to achieve net zero energy buildings by 2030. Interns work closely with a mentor inside the firm to gather data about firm projects and enter it into the AIA Design Data Exchange tool, a global database to both promote and archive information about building performance. Mentors report that the interns organize information, track trends and create workflow processes that provide a valuable feedback loop while empowering lasting change to improve energy efficiency in future projects. 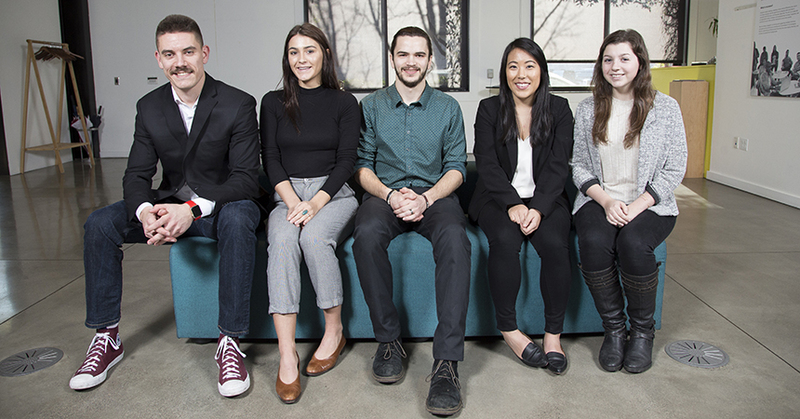 The 2019 intern class includes Matt Loudermilk, Carleton Hart Architecture; Madelaine Murray, Hennebery Eddy; Lindsay Naganuma, Holst Architecture; Austin Daich, Speranza Architecture, and Jessica Meylor, OTAK. Four of the five are currently earning master’s in architecture degrees, and one is completing an undergraduate degree. They share a passion for sustainable design, and a commitment to putting classroom lessons into real world practice. The five Net Zero Emerging Leader interns are scheduled for a free panel presentation during Design Week Portland. On April 11, 5:30 PM, at AIA’s Center for Architecture, 403 NW 11th, the students will share their personal experiences learning about sustainable design and discuss how the internship prepared them to enter the workforce ready to design buildings of the future.